O’Leary, Miriam (c1865-1930) made her debut with the Boston Museum Company in March of 1881, performing a bit role in support of Dion Boucicault in his play Colleen Bawn. A gifted singer, she played The Lady Saphir ( a rapturous maiden) in the Museum's American premier production of Gilbert and Sullivan's Patience, which ran for a record 100 performances. In April 1882, she supported Lester Wallack as Rosa Leigh in Rosedale, and the following month played Betty in Sardou's Butterfly Fever, demonstrating acting talent and a developing technique. From there, she made more rapid progress and became an audience favorite. Promoted to the position of Leading Soubrette, she specialized in saucy, coquettish, and intriguing roles. On May 10, 1887 New York audiences saw her at the Star Theatre in a celebrity studded testimonial to actor C. W. Couldock’s fiftieth anniversary on the stage. The program included Edwin Booth in the third act of Hamlet, Fanny Davenport in the screen scene from School for Scandal, and Joseph Jefferson, James O’Neill, Kyrle Bellew, and Mrs. John Drew in the third act of The Rivals. Miriam played Brutus’ boy servant Lucius in the quarrel scene from Julius Caesar, featuring Lawrence Barrett as Cassius. A packed theatre fell hushed as Lucius sang his master to sleep. The next month, Miriam opened in The Hypocrite at the Fourteenth Street Theatre. The play was a reversal of Othello, with a white Othello gulled by a black Iago in New Orleans before the Civil War. The play was dismissed by the critics, but the production was widely praised for it acting and stage craft. The June 7, 1887 New York Times wrote: "The agreeable personality of Miss Miriam O’Leary, and the wholesome inherent humor of Mr. Charles S. Dickson, made the comedy of the piece almost bearable." The New York Spirit of the Times observed on June 11: "The hit of the piece – and it not a heavy hit –is made by Miriam O’Leary and Charles Dickson as the comedy characters. Miss O’Leary comes from Boston; has a piquant Irish face, a clear sweet voice, and a natural straight forward style of acting that will win her popularity." 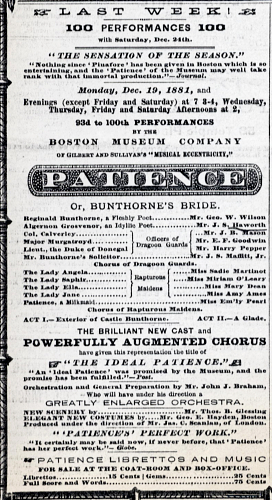 Miriam returned to the Boston Museum Company’s rigorous schedule which included the role of Jenny Buckthorn in the original production of Shenandoah, which opened on November 19, 1889. She continued to act at the Museum, taking a bit of time out in January 1892 to marry Boston physician David A. Collins, a man of wealth and social prominence. The New York Times reported on January 24, 1892: "The proposed marriage has been kept very quiet, even to the point of having a ‘special dispensation’ granted by the Archbishop to avoid the custom of ‘calling’ the names on the two Sundays preceding the ceremony. Miss O’Leary will not retire from the stage." "Betty’s Finish, comedietta by Clyde Fitch, produced at the Boston Museum, on Monday, was a disappointment. Betty has been sent to a New York School to be finished; flirts with the faculty of a college; saves Jack her lover from expulsion, and – that’s all. It is told disjointedly and undramatically, and the effect is like turning over the leaves of a comic book hurriedly. Miriam O’Leary carried the little play on her pretty shoulders." In March 1892, the New York Times reported that Miriam O’Leary "is to retire from the stage for domestic life," and the Boston Museum closed its regular season on May 22, 1892 with a benefit performance for her featuring Betty’s Finish this time coupled with Lady Jess. But the following fall, Miriam acted at Charles Frohman’s Boston stock company in the premiere of Augustus Thomas’ Civil War play Surrender. Of her performance, the November 22, 1892 New York Times wrote: "Miriam O’Leary, of the old Museum company, though she had a minor part, made a great deal of it." She continued to act occasionally until leaving the stage definitively in 1900. On February 12, 1912, the Boston Traveler reported: "At the request of Lindsay Morison, Miriam O’Leary of the old Boston Museum stock company has consented to return to the stage after an absence of 12 years, and will appear next week in the auditorium in Lynn, in the same company with her daughter, Miriam Collins, 17. Miss O’Leary is the widow of Dr. Collins, and her daughter has been appearing with success in the Lindsay Morison stock company in Lynn, and will also appear when the company opens its summer season in Boston. Miss O’Leary will be the Nurse in Romeo and Juliet, and it will be the first time mother and daughter have appeared on the stage together." She is also the mother of May Collins – who married James Loree and retired. She played Lady Teazel for George Tyler in 1925. Her brother David had married Miss Loree and she married his brother-in-law. This Leonor Loree Collins is therefore her nephew – Good fortunes never came to finer people! Agnes O’Leary, Miriam’s sister, became Agnes Acres and appeared with Jefferson in The Rivals taking the name "Acres" from the play – She was very pretty – Married Barton Jenks the artist – and died while quite young. The O’Learys were cousins of Joseph Haworth’s – So many sweet memories were stirred by this news"
And on July 26, 1950, Mrs. Locke wrote in part: "O’Leary : Miriam – later Mrs. David Collins. Her family was one of our neighbors. She was one of the best loved Boston actresses. Her children married very well, into the Loree family of New Jersey. Her grandson Werner Loree Collins was married in June. May Collins, of course, you remember in Mr. Tyler’s School for Scandal …..Miriam died while I was abroad in the late 20’s or 30’s. Her sister, Agnes became Agnes Acres after a season with Jefferson – married Barton Jenks. She was as airy and theatrical as Miriam was down to earth. Another sister Theresa became a lawyer and a very able one I hear. They were cousins of Joseph Haworth and William Haworth." Joseph Haworth and Miriam O’Leary were first cousins. Joe was a leading actor at the Boston Museum when he brought his young cousin to the attention of manager R.F. Field in 1881. Joe coached Miriam in her early roles and helped launch her on a career that was singularly successful. They acted together many times at the Museum, notably supporting Dion Boucicault in The Colleen Bawn, in the American premiere of Gilbert and Sullivan’s Patience, in Rosedale starring Lester Wallack, and in Sardou’s Butterfly Fever.